I was talking with a friend last week about interpersonal interactions being motivated by either a desire to build a relationship or to complete a transaction. So I was surprised to hear these words – relationship and transaction – come up in the recent episode of the Dear Sugars podcast on saying no (with Oprah Winfrey). I believe that when the universe keeps unexpectedly throwing up certain words or phrases in front of you, it’s worth paying attention. In her email newsletter this week Laura Vanderkam asked can you do ‘deep work’ if you also have deep responsibilities? It captured some of the frustrations I had with Cal Newport’s Deep Work, which I love the idea of but struggle to see how it can be implemented in reality by people with lead parenting (or other primary caregiving) responsibilities – which are most often women. However, I like Laura’s suggestion that perhaps Deep Work can be achieved in smaller blocks or through ‘retreats’. 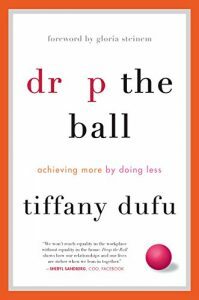 I also finished Tiffany Dufu’s Drop The Ball – a book for women about letting go at home. My friend Ruth wrote an excellent review of the book, and if you’re not inclined to spend the time or money to read the book but are still interested in the idea, I recommend listening to Tiffany’s interview on Jonathan Fields’s Good Life Project podcast.